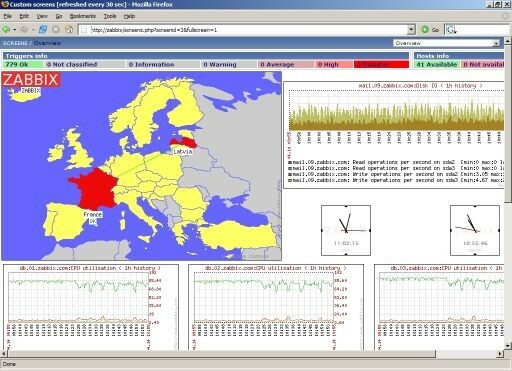 ZABBIX is software for monitoring of your applications, network and servers. ZABBIX project supports both polling and trapping techniques to collect data from monitored hosts. A flexible notification mechanism allows easy and quickly configure different types of notifications for pre-defined events. Apache. Version 1.3.12 or later required. MySQL (or PostgreSQL). Version 3.22 or later required. PostgreSQL (or MySQL). Version 7.0.2 or later required. ZABBIX may work on previous versions of Apache, MySQL, PostgreSQL as well. If using PostgreSQL, version 7.0.2 or later is strongly recommended. MySQL or PostgreSQL development files (headers and libraries). Note: Usually provided as part of mysql-dev or postgresql-dev packages. PHP. Version 4.0 or later required. PHP must be compiled as Apache module. PHP 5.0 is supported as well. PHP GD or GD2 module. The module is required for displaying graphs and maps. The module must support images in PNG format. GNU Make. Required for building ZABBIX or its agents from sources. In case if pre-built binaries are used, GNU make is not necessary. NET-SNMP (or UCD-SNMP) library and header files. Required for support of SNMP agents. Optional. Open SSL library and header files. Required for SNMP support. Optional. This release introduces support for ListenIP for the ZABBIX server, and contains several important bugfixes. NetWhistler 2.6 is a easy to use Network monitoring software that offers integrated fault and performance management functionality.